Campus visits are the ultimate sales pitch for prospective students. There is no better way to truly experience a college than walking across campus, sitting in on a class, checking out the dorm rooms, and asking questions of current students, professors, and admissions counselors. Schools strive to fill up all available slots for tours, visit days, and open house events. In addition to traditional means of promoting such visit opportunities, colleges have turned to social media to encourage students to talk among their peer group about their upcoming or past visit. An excited, enthusiastic student can be one powerful, not to mention FREE marketing mouthpiece for colleges. The question is: How do you increase the likelihood of students sharing their campus tour experience on social media? Ken Cutts, Recruitment and Media Services Manager at the University of Wisconsin – Madison, had a vision: a big red frame, imprinted on both sides with popular Twitter hashtags that could be used to photograph prospective students during campus tours or events. This would be a fun and engaging way for UW Admissions to share images on social media. Ken reached out to Magellan Collegiate Promotions to see if his idea could be created and imprinted with #FutureBadgers on one side for larger group photos and #FutureBadger on the other side for single student pictures. Account Manager Elise Mannebach researched available options, finding a corrugated plastic sign that could be modified to fit UW-Madison’s application. Starting with a large 31” x 46” white yard sign, production determined that the center could be cut out to create a durable oversize frame that could be used over again and again. Red screen printing helped the white letters really stand out and show off the school’s famed Badger red. The oversize picture frames were extremely well received by the Office of Admission and Recruitment and campus visitors alike. The office routinely used the frames on campus tours, at campus events like Homecoming, and on special visit days for prospective and admitted students. Activity and images posted to #FutureBadgers / #FutureBadger has increased 35% in just the few first months on Twitter and Instagram. 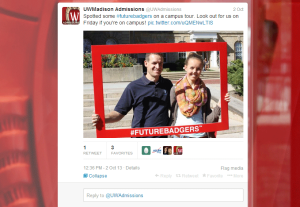 #FutureBadger has also been integrated on direct mail pieces and in presentations. Visitors could further show off campus by positioning the frame in front of an iconic view or campus building. At UW-Madison, the Terrace on Lake Mendota or the Abraham Lincoln Statue in front of Bascom Hall would be two of MANY possible photo-opportunities. A custom oversize frame is a creative and visual way to use promotional items to help prospective students show their excitement, while actively endorsing a college via social media.